Criticism can be helpful, but even when it’s constructive, it can be hard to take—especially at work. How do you deal with criticism productively? Jennifer Bridges, PMP, shows you strategies on how to handle criticism at work. Here’s a screenshot of the whiteboard for your reference! What is criticism? Jennifer started by defining the word. She explained that criticism is an expression of disapproval of something or someone based on perceived faults or mistakes. In other words, it’s not infallible. Criticism can be delivered in two ways: solicited and non-solicited. The obvious difference being the former is asked for, and the latter is not. Asking for criticism at work can be structured in a 360 review, a performance review, or by seeking feedback from coworkers in a peer review. You could also look outside your team and ask a coach, mentor or adviser. Non-solicited criticism can come in many forms, too. It might be a customer or a bad boss. There could be criticism from a team member or other peer. Truly, anyone that you interface with at work, whether in person or via collaboration software, is potentially able to deliver non-solicited criticism. Regardless of where the criticism is coming from, whether you asked for it or not, the choice of how to handle that criticism is yours. Do you accept the criticism or defend yourself? Can it be used to improve your performance, or do you ignore it? Jennifer put the question in context by asking a hypothetical. If you were, say, competing in the Olympics, or performing surgery, or diffusing a bomb, or flying a plane, wouldn’t you want to be doing that at your best level? Professionals in any discipline are always trying to improve their performance, enhance their skills and work towards better precision in all that they do. Perfection can never be achieved but should always be sought. So, how can you use criticism to better yourself and your work? Listen: It’s easy to be dismissive; it’s hard to listen with an open mind and pick the truth out of what could be an emotional response. Acknowledge: Most criticism isn’t meant to be hurtful, even if it’s not tactful. Therefore, be respectful and thank the person for their input. Ask: Repeat back the criticism to make sure you heard it right; then ask questions to clarify what they meant. Consider: Maybe what they’re saying is true. This is a consideration that must run through your mind. If you don’t give the criticism the due diligence, then you’re never going to know when the criticism hits home. Compare: This is where you can offer a counter-argument. Explain your point of view, what you think you did, without anger or defensiveness. It will help you understand their point of view and gauge its accuracy. Create: If you’ve determined that the criticism is valid, the next step is to use it as a springboard to develop an action plan to strategically address the issue and work towards improving your performance. Solicit: Now, as you work towards addressing the criticism, keep others in the loop as you practice at getting better, both at the issue and at taking criticism. Remember: don’t be too hard on yourself. It’s human nature to be critical of others and react defensively when that criticism is directed towards yourself. Use this knowledge as an opportunity to observe how you give criticism and what you criticize, so you’re less hurt and have a more positive impact. Pro-Tip: One way to help you handle criticism better is by understanding how to give criticism. Criticism can be a creative, not destructive, tool if it’s applied properly. Everyone can be served by learning how to deliver constructive criticism. Today we’re talking about how to handle criticism at work. And I submit most of us could stand to improve. But before we start, I want to clarify what criticism is. So, criticism is the expression of disapproval of something or someone based on perceived faults or mistakes. So because it’s perceived doesn’t mean it’s true. Criticism can come in two forms: solicited or non-solicited. So, solicited feedback is something that we ask for, we go seek it from others. You may have heard of a 360 review at work where you go solicit people on your teams, maybe your peers to provide you feedback and criticism, also peer reviews or even maybe from a coach, a mentor and an adviser. But non-solicit, we didn’t ask for this. Sometimes it comes from a customer or a boss, a peer or team member. So, what we look at is how we choose to act or react, accept or defend or even improve or ignore. Let’s change our lens and how we look at this. So, if you are competing in the Olympics, performing brain surgery, if you’ve been called in and diffusing a bomb, if you’ve been asked to sing the national anthem or maybe even if you’re flying a plane, I would submit you would want to be your best at doing any of these. So, the people who do these…they’re trying to be their best, they’re trying to improve their performance. That may be their scores. It may be their times. They also look to enhance their skills and expertise and perfect their precision. 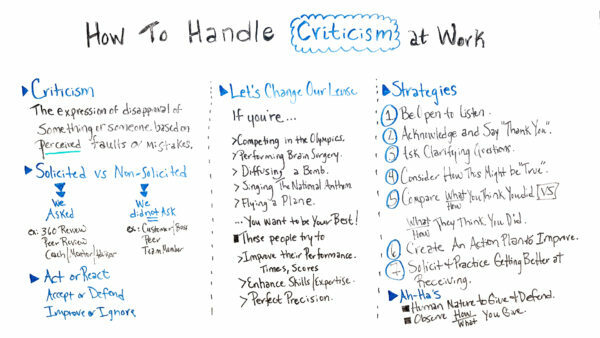 So, here are some strategies for receiving criticism at work. So, first of all, be open to listen, just pause and hear what someone has to say. Number two, acknowledge and say, “Thank you.” So, it gives you time, if nothing else to prepare and pause. Also, number four, consider how this might be true. Whether criticism comes in a good form of bad form, you know, there are components to it that may be true. So dissect it and see what you can learn from. Number five, compare what or how you think you did on something versus what and how they think you did. What’s the difference? Compare the two, and see how you might improve. Number six, create an action plan. Take what they say and build, maybe it’s professional development, maybe you want to look at maybe getting some additional training, maybe get a coach or mentor, some way to improve your own performance. The number seven, I really like. It’s learn to solicit instead of having non-solicit. Learn to solicit the criticism or feedback and practice getting better at receiving it. So, here are some two favorite Ah-Ha’s. Number one is, it’s human nature to give criticism and defend our own position. And number two, observe how and what you give. Many times if we’re criticizing others or giving feedback to others on certain things, it’s maybe areas that we’re seeking internally to improve on yourself. So, if you need additional resources on how to handle criticism at work, then sign up for our software now at ProjectManager.com.